CallingCard.com sells about a half a dozen well designed prepaid calling plans. Their prepaid plans are very easy to understand and they offer very low outbound international calling rates from the United States as well as many other countries worldwide. CallingCard.com is a reseller that markets prepaid calling cards packaged specifically for them by 3rd party carriers. That means these phonecards are unique to CallingCard.com. CallingCard.com has an outstanding website that is very informative and easy to use. They do a fine job disclosing fees and providing essential information about each card. CallingCard.com is sister company to CallingCards.com, another company we recommend. Overall, we definitely like CallingCard.com and recommend them for your next calling card purchase. 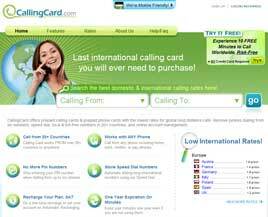 Description CallingCard.com sells several prepaid calling plans, such as 'Europe', 'Africa', and 'Value', among others. The plans vary in terms of billing increments and fee structures. The plans are designed primarily for outbound international calling from the United States. But the cards will work globally via over 30 international access numbers which can be handy for people who travel periodically. Parent Company Universal Calling, Inc. Competitive prices US outbound international long distance calling rates are fairly low - though not always the cheapest available. Rates inbound to US or between other countries are fairly high. Access numbers are working all CallingCard.com plans use the same US toll-free and local access numbers. We have not experienced any busy signals or delays. CallingCard.com has consistently high ratings across our evaluation criteria. It is one of the strongest calling card companies we have reviewed. We recommended you consider them for your next calling card purchase. Disclosure: AboutCallingCards.com recommends a small number of vendors based on in-depth company reviews and analysis. We recommend only firms that we believe deliver the best value to consumers. Read complete disclosure statement.